Desoldering braid or desoldering wick is a pre-fluxed copper braid that is used to remove solder, which allows components to be replaced and excess solder (e.g. bridging) to be removed. The soldering iron is applied to the wick as it sits on the solder joint, and when both are brought up to the solder's melting point, the flux is activated and, through capillary action from the braided design, solder is drawn up the wick. 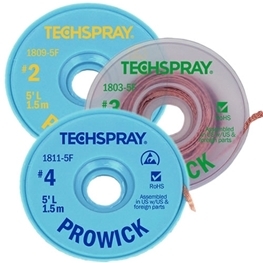 Techspray wick has been a mainstay at PCB rework, repair and prototyping stations for over 30-years. No-Clean desoldering braid - coated with proprietary flux that only leaves a slight clear residue, which does not cause dendritic growth, corrosion, and other service issues. Cleaning after using Techspray No-Clean wick is optional. Pro-Wick desoldering wick - coated with a fast activating rosin flux for lightning fast solder removal. 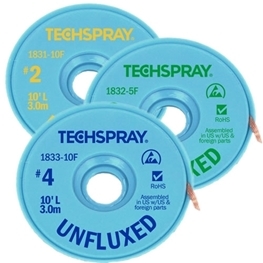 Unfluxed desoldering braid - ideal for customers that use an aqueous flux, or are required to maintain the same flux throughout board assembly and rework. All Techspray desoldering braids are effective solder removers, and effective on lead and lead-free solders, is compliant with RoHS, and does not contain SVHC as defined by REACH.